Following World War II France made determined efforts to catch-up with other countries in developing high-performance aircraft and designed successful machines to fulfill the needs of the Armee de l'Air, the Marine Nationale and compete in export markets.For the next twenty years they were the only aircraft manufacturers to investigate with equal effort, turbojet, ramjet and rocket propulsion for manned fighters, either taking advantage of German 'war-booty' technology or using national pre-war research. A few, such as the Leduc and Griffon ramjet-powered fighters, reached prototype form, the Trident rocket-interceptor advanced to the experimental series (pre-production) stage and the Ouragan, Mystere, Super-Mystere, Mirage III and Etendard were produced in quantity and went on to win export orders. Later, when the turbojet had won the race for the optimal propulsion system, many attempts were made to design variable-geometry aircraft (including the Mirage G series) and VTOL types (the SNECMA Coleoptere and Dassault Mirage IIIV), and there were even a few flying boat interceptor studies. In the late sixties, in the pursuit of ever-higher speeds, Nord Aviation, Sud Aviation and primarily Avions Marcel Dassault also produced many Mach 3+ proposals. 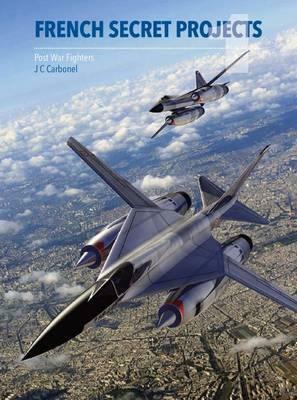 Period drawings, promotional art, photographs of prototype aircraft, mock-ups, wind tunnel and promotional models are all combined to present, for the first time in the English language, a complete view of French military aircraft design from the Liberation of France to the late twentieth-century.